Now Ricky is best-known for the legered-meat technique which has caught him so many match-winning barbel — hence his nickname, Ricky ‘The Meat Master’ Lees -but he is an excellent float angler too. In fact there’s nothing he likes better than inching a lightly shotted stick float down the inside of a deep Severn swim. It’s for this very reason that he has chosen today to fish a peg known locally as ‘The Long Hole’. It transpires that a fellow Brummie of somewhat rakish appearance and greatly respected on the Midlands circuit — an angler by the name of Keith Evans -decided the result conclusively in favour of the float, by sneaking out 25lb (II.3kg) of belting great roach from this very swim! The peg is set between a couple of alders, and the fact that they are a comfortable distance apart is what gets the peg its name. 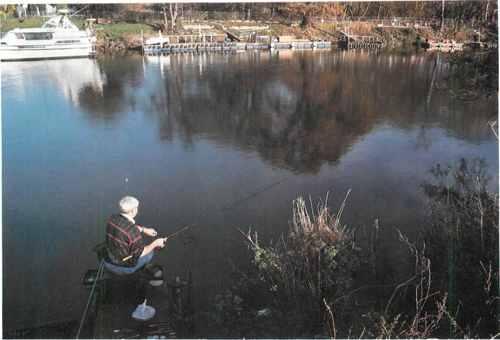 At the bottom of the bank there’s a sturdy little platform which pushes the angler slightly into the flow – giving him a command of the water right down the inside. According to Ricky the river’s about 2.4-3m (8-10ft) deep here and this, coupled with a steady pace and boil-free flow, is what makes it a classic trotting peg. Ricky uses a 13ft (3.9m) rod with a soft, extended spliced tip. It is quite capable of handling 1lb (0.45kg) hooklengths, but is fairly powerful in the lower regions – important here because apart from roach there are chub and barbel too. Ricky finds that a large, closed-face reel – like his old Abu 507 — is ideally suited to the job. When trotting, its large spool delivers line with complete freedom — something he feels is essential — and its sturdy construction makes it a fair match for a barbel. What’s more, the line doesn’t tend to bed into the spool after a hard fight as much as it would with a smaller spool. The float is a 4 no.6 stick, made by Thomasny Sherwood – yet another legendary Midlands matchman and a great and longstanding friend of Ricky’s. The hook is of fine wire with a round bend and a long shank -such as the Drennan caster hook — tied to a 1lb (0.45kg) hooklength. Says Ricky: ‘I’ve taken barbel to 10lb 4oz on lV^lb line so we should be okay.’ it underhand into the cool blue of the reflected sky – about 4m (13ft) off the tip of his rod. The plummet finds the bed of the river 2.7m (9ft) below the surface. ‘I like to have a few runs through before putting any bait in,’ he explains, removing the plummet and burying the hook in a caster. ‘There’s no point in throwing bait on top of a snag.’ Having run the float through a couple of times unhindered, he is finally ready to go. Holding the rod high, he keeps all but 45cm (18in) off the sun-spangled water. Somewhere just past the shadow of the alder is the float — but we can’t see it — and about 2.7m (9ft) below the float, tripping over mud, twigs and dead autumn leaves, is the caster. There’s something else there too because the line suddenly zips smartly across the surface as it follows the float under. 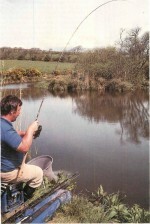 The rod tip bounces round and Ricky patiently draws the fish up the swim. ‘We all think that roach are the ‘fisherman’s fish’,’ he says, beaming. ‘They look nice, come in nice and they don’t dive for snags.’ He carefully unhooks the 8oz (0.23kg) roach and pops it cheerfully in the keepnet. One small roach later and it has gone quiet. ‘They’re down there – they ain’t going anywhere – it’s just that they ain’t opening their gobs,’ says Ricky philosophically, laps- ing into schoolboy Brummie. The river’s ancient name is Sabrina. She’s a lady of many moods and can be a tough nut to crack. Still, Ricky ought to know her as well as anyone – he’s had an extra-marital affair with her for long enough! After spending a short and fruitless spell on the meat hoping for a barbel, Ricky has returned to the float. He has changed down to a size 22 hook baited with maggot and just missed a bite. Says Ricky: ‘By using a maggot we’re being less selective -just hoping for a fish.’ In fact, next run down he’s into a better roach — this time a quality 12oz (0.34kg) fish. He’s kept just a few casters and hemp going in like clockwork right through the session and it looks as though things are picking up. After bumping off what felt like a chub, Ricky has had two more 8oz (0.23kg) roach. The sun is much lower now but if anything it’s a bit easier to see the float. He’s changed to a slightly heavier stick – taking 12 no.8 shots – and has shallowed off by 60cm (2ft) – so the bait is right off the bottom. And that’s the trouble – the fish are so shy under these conditions that to coax them on to the hook is a tall order – while keeping them there is nigh on an impossibility! It’s half an hour later – and Ricky breathes an audible sigh of relief as he lifts the landing net. A F/Jb (0.56kg) roach lies safely at the bottom. That fish has made all the difference. The clarity of its orange eye and the sharpness of its crimson fins—which look as though they might have been shaped with scissors — the overall perfection somehow accounts for what makes these fish so difficult to catch. When Ricky pulls out his keepnet he finds, much to his surprise, that it contains quite a nice little bag of handsome, hard-earned fish – less than he’d have liked, of course, and not enough to win a match – but worth all the trouble.